Today it's very common to create hydroponic crops using techniques where nutrient solution is not recycled. This type of crop, commonly called drain-to-waste (DTW) or run-to-waste (RTW) offers the advantage of having a very cheap setup - since no recirculation is used - with the big disadvantage that nutrient control becomes harder as there is no constant feedback of how the plants are affecting the nutrient solution. Today I want to talk about the main differences between a RTW crop and a recirculating crop and how nutrient management needs to be done in order to be effective in RTW setups. One of the most important difference between both crop types is the substrate. In a RTW crop you want the substrate to have a much higher capacity for water retention since you want to irrigate less frequently and ensure the plants are in contact with nutrient solution as much as possible without having aeration problems and a lot of run-off. Having a lot of run-off means wasting more nutrients in a RTW setup so you want to have a media that can minimize this. This means having a media like peat moss or coco coir where water retention can be very substantial. The problem with the above is of course salt accumulation within the media. 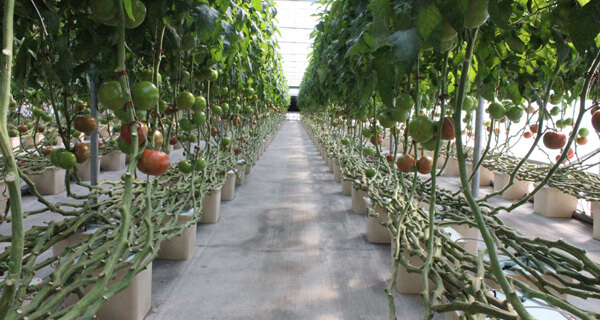 If you irrigate the plants with a full strength nutrient solution and you irrigate when the level of moisture descends then this is both because the plants have absorbed water and the solution has evaporated to some extent. This means that the next time you irrigate your total amount of salts will be the amount from your current irrigation plus the amount accumulated in the media. This can quickly turn into a very problematic situation where the plants are subjected to extremely high conductivity levels. This is why run-off monitoring is key in RTW setups. You usually want to water your plants enough to allow for some run-off - usually 10-20% of the plant container's volume - so that you can perform measurements of pH and EC over that run-off. This is why it's so important to have the plants over trays where run-off can be collected as measuring the run-off is very important to ensure that your plants are receiving adequate nutrition. Measuring the run-off of every plant is impractical so collecting the solution from many plants in a single tray and then measuring that output is a lot easier. Alternatively - if you cannot place the plants on trays - you can use a suction lysemeter to take out solution from a few plants after watering to monitor conditions around their root zone. In a RTW setup your run-off will always tend to be more concentrated than your input - this is normal - but you want to have conductivities in your run-off no more than 30% greater than your input concentration. If this is the case you should do plain water irrigation until your run-off has at least the same conductivity as your originally desired input. When you water with plain water also make sure you adjust the pH of the water to the value you desire. One of the lead causes of bad results in RTW setups is to have salinity build-ups that cause nutrient lock out simply due to a general lack of run-off monitoring. In general if watering using conductivities close to or above 2 mS/cm plain waterings should be done once for around each 1 or 2 nutrient solution feedings. The pH is also very important. Depending on your media your pH can change substantially between your input and your run-off but in general you want your output pH to be as close to the desired pH as possible. You can compensate a bit by changing the pH of your input solution - for example if your run-off pH drops you can increase the pH of your input solution - but never increase your input pH above 6.5 or below 5.5. Some media like peat can acidify solutions a lot with time, in these cases it's very important to pretreat the media to avoid these problems with output pH. A strongly buffered input solution can also help in these cases. Before starting your crop always test the run-off pH/EC of the media without plants to ensure you can make any needed treatments before you actually start your crop. The key to successful RTW setups from a nutritional perspective is run-off monitoring. Once you start monitoring your outputs you will see how your plants respond to your input solution and you'll be able to better control the plants' root zone environment. Of course these issues are all eliminated by recirculating setups since in that case the nutrient solution returns to the tank and there is a constant feedback of how the plants are affecting the solution. This can make recirculating setups much better at giving higher yields.